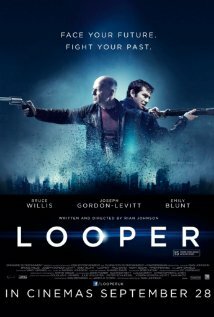 Looper brings together two of my favorite things, Bruce Willis and Time Travel. Joseph Gordon-Levitt is also creeping onto my list of favorite actors too. That aside one of Bruce's best performances was many years ago in another time travel movie, Twelve Monkeys, alongside Brad Pitt (another of my favorite actors). Another great film for people who like smart, time travel films. The above mentioned Joe is played by Joseph Gordon-Levitt, whilst the older Joe sent back in time is played by Bruce Willis. 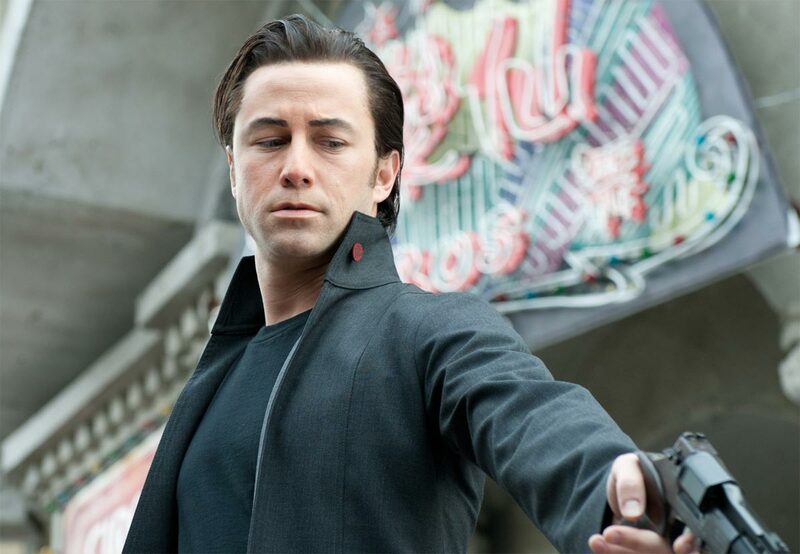 There's no need to tell you to go see Looper, you should just see it. Pretty much everyone says it's a great, intelligent sci-fi movie that, at its heart is about relationships more than time travel. I bought the Blue Ray disc version having not had chance to see this in theaters and wasn't disappointed at all with my purchase. I'll definitely be watching this one a few times. The plot, like just about every time travel film, raises more questions than it answers simply because we don't really know what happens when you mess with people's past history by travelling back from the future. But that's what makes time travel movies interesting to think about and discuss afterward. 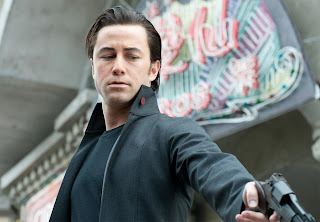 For example there's a confusing point in Looper where we see Joe successfully kill his older self even though the whole movie revolves around the fact that Joe didn't successfully kill his older self at that moment. However, if you try to follow the logic, Joe has to have successfully killed his older self first in order for his older self to loop back in time to try and change the past and not get shot by his younger self. From there you can go on and have whole discussions about whether time is linear or can be looped back on its self etc. Well if you like those kind of discussions. If not then Joe's whole purpose for changing the past is intriguing in its self and revolves around the fate of his future girlfriend and a future Mob boss. If I said too much more it would start to really spoil the story so I'll move on to other things I liked about the film. The film is set in 2044 and follows a timeline 30 years into the future from that year. What's great about it is that the future doesn't look a whole lot different to today's world even though there are some nice pieces of future technology woven into the mix of familiar. One of the characters owns a fairly cool jet bike that looks, literally like a jet engine with a bike seat and handle bars on top of it (no wheels). This technique of designing the future in a retro fitted kind of way gives just enough hints that we're not in the present day whilst still keeping everything grounded in what feels like a very real and credible future world filled with the familiar. In fact the design of the film almost pays homage to the set design of the movie Blade Runner but in a much lighter and open world. The only thing I struggled a little with in this film was Joseph's facial prosthetics to make him look more like a younger Bruce Willis. I guess he does but for those of us who actually remember what Bruce looked like early on in his career, it doesn't quite match the memory. It's not a big issue though. The story is so strong they could have done nothing to Joseph's face and I still probably would have had no trouble accepting him as younger Joe. Overall this film is as good as most people say it is. Well worth seeing and definitely a great addition to any sci fi buff's movie collection. I think, with any time travel movie, there's always a few things that don't add up. That's why I think they're good movies for discussion afterward. I was listening to an interview with Looper's director and he said Bruce has quite a distinctive nose and chin which prompted the makeup on Joseph. Can't say I've really noticed Bruce's distinctive features, which is why I probably would've been fine if Joseph had gone without all the make up.